In 1832 he went to Munich, where he studied at the Panhellenic School established by Ludwig I of Bavaria for the orphans of the warriorsin the Greek War of Independence. 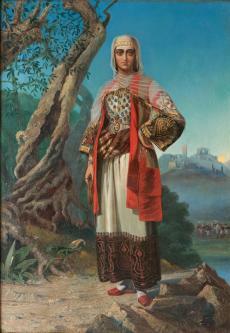 In 1844 he was admitted to the Munich Academy, and until 1855 he received a grant from the Greek community. He travelled in Europe and, in the late 1840s or the early 1850s, he visited Greece in order to study the landscape and figures he was to depict in his historical paintings. Upon his return to Munich, he established a studio, in which several students worked. In 1853, he earned the first prize at an exhibition in Vienna for his Exodus from Missolonghi; he also participated in the Paris Exposition Universelle (1855) and the London International Exhibition (1862). He painted the Greek Orthodox Church of the Annunciation in Manchester (1861-1863). The paintings he bequeathed to the University of Athens are now in the National Gallery Collection in Athens as part of the university’s donation. The main exponent of historical painting in 19th-century Greek art, Vryzakis shaped his personal style in the Neoclassical-Romantic spiritof Munich and, following the precepts of the Academy, systematically depicted the events and figures of the Greek War of Independence.